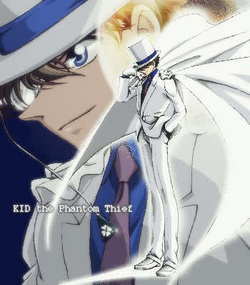 Written and illustrated by Gosho Aoyama, Magic Kaito has been serialized in Weekly Shōnen Sunday since 1987. It was halted in 1994 when Aoyama's new series, Detective Conan, was instantly popular. Although he occasionally returns to Kaito, with chapters published irregularly since. To date the chapters have been collected into 4 tankōbon volumes by Shogakukan. In 2011, they were republished in "Treasured Editions" from August 15 to December 16. Two versions of each volume were released, one containing a DVD of one of the TV specials. While there has not been an official English-language release of the manga, it has been translated and released in Italy, Spain, Germany and Taiwan, by Star Comics, Planeta DeAgostini Comics, Egmont Manga & Anime and Chingwin Publishing Group respectively.